authors, especially those who’ve written books for a general audience. and the Italian Diaspora: Fifty Years of Italian American Studies. Villano’s book is being called a “memoir that reads like a thriller.” It is the true story of two brothers living dramatically different lives, with one working for former Governor Mario M. Cuomo of New York, while the other was associated with John Gotti and the Gambino Crime family. A former labor journalist, speechwriter, essayist, poet, and documentary film writer, with his work appearing across numerous national media outlets and platforms, Steve Villano worked for GovernorMario M. Cuomo of New York, from 1985-1993. During that same time, there were several national boomlets for Cuomo to run for President. Meanwhile, Villano’s brother was associated with JohnGotti of the Gambino Crime family. Within days of of each other in December, 1985, Gotti became the head of the Gambino Crime Family, following the murder of Paul Castellano—and Cuomo, upon Ted Kennedy’s withdrawal from consideration for the 1988 Democratic Party’s nomination for President, became a national contender for the Presidency, in the judgment of many politicians and members of the media. 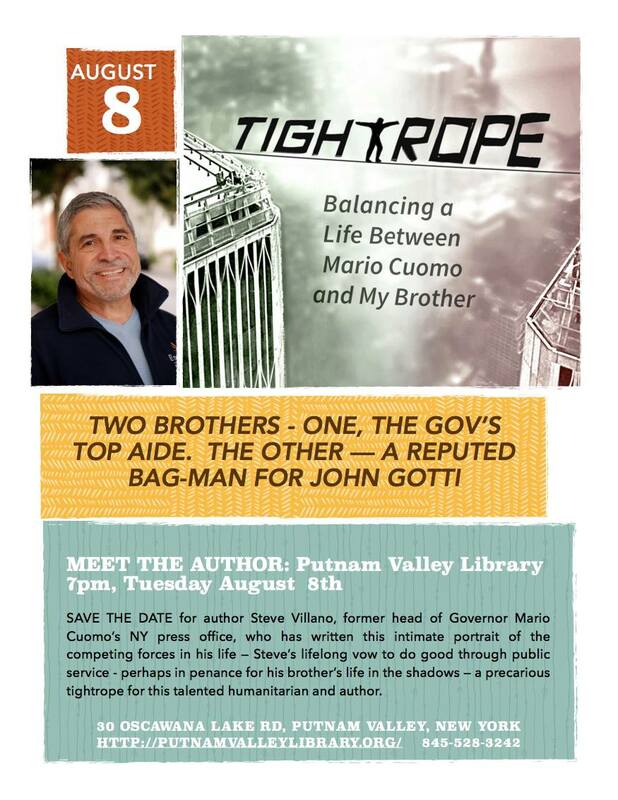 In Tightrope: Balancing A Life Between Mario Cuomo & MyBrother, Villano shares the wrenching conflict between his family’s ties to organized crime and his love for his brother, his own integrity and his commitment to Mario Cuomo and public service. ABOUT THE AUTHOR: STEVE VILLANO, a native of Brooklyn, New York, is the former head of Governor Mario M. Cuomo’s New York City Press Office, with decades of experience in public service, public education, public health, and as CEO of several national, non-profit organizations. His writing has appeared in mass circulation newspapers and magazines such as The New York Times, Newsday,The Albany Times Union, The Rochester Democrat & Chronicle, the Napa Valley(CA) Register Newspaper Group, the North Shore (Long Island) Newspaper Group, Working Mother Magazine, Associations Now Magazine, and Today’sEducation. His essays have been published on-line on the WritersDigest.com, www.thenationalmemo.com,, with a subscription circulation of 300,000; on Medium.com., and on his blog, Radical Correspondence, (www.socialvisionproductions.com. Villano presently lives in Northern California. JOIN US AT THE PUTNAM VALLEY (NY) PUBLIC LIBRARY, AUGUST 8, 2017! New York Publisher, Heliotrope Books, Announces Availability of “Tightrope” in Kindle & Paperback Versions, on Amazon & Barnes and Noble. NEW YORK CITY – Tightrope: Balancing A Life Between Mario Cuomo and My Brother is the true story of two New York brothers who travelled dramatically different paths. Though author Steve Villano and his oldest brother Michael lived in two separate worlds, they shared love, loyalty, a sense of duty and personal sacrifice. The author’s lifelong quest to work in public service, partly as penance for his family’s background with both the Genovese and Gambino crime organizations, became a precarious tightrope on which he struggled for years to find his balance. 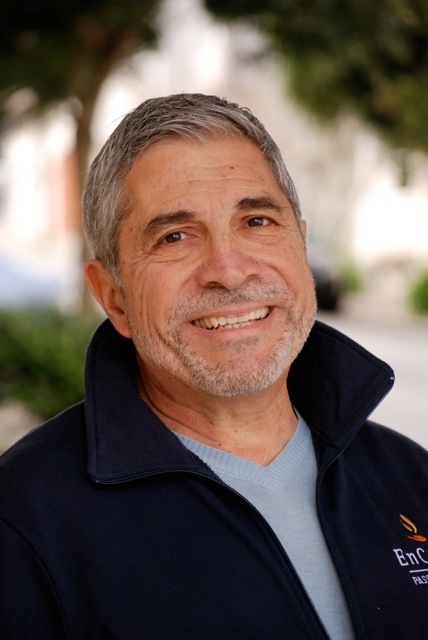 A former labor journalist, speechwriter, essayist, poet, and documentary film writer, with his work appearing across numerous national media outlets and platforms, Steve Villano worked for Governor Mario M. Cuomo of New York, from 1985-1993. During that same time, there were several national boomlets for Cuomo to run for President. Meanwhile, Villano’s brother was associated with Gambino Family organized crime boss, John Gotti, Jr., at the peak of Gotti’s power. Within days of each other in December, 1985, Gotti became the head of the Gambino Crime Family, following the murder of Paul Castellano—and Cuomo, upon Ted Kennedy’s withdrawal from consideration for the 1988 Democratic Party’s nomination for President, became a national contender for the Presidency, in the judgement of many politicians and members of the media. 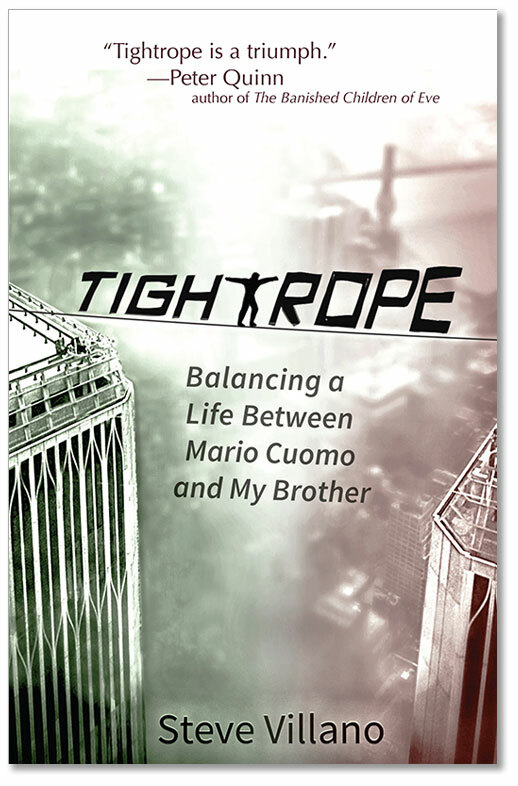 In Tightrope: Balancing A Life Between Mario Cuomo & My Brother, Villano shares the wrenching conflict between his family’s ties to organized crime and his love for his brother, his own integrity and his commitment to Mario Cuomo and public service. “Steve’s book is a frank and unvarnished account of the long struggle in his New York Italian-American family… Steve took an upward path in his career, becoming an impeccable civil servant, working for one of America’s most distinguished Italian-American governors, Mario Cuomo. His brother took an oppo- site path, associating with the most feared Italian-American mobster of his generation, John Gotti. Villano dealt with these opposing forces of light and darkness, abhorring his brother’s choice but still feeling love for him, hiding the truth from friends, and teetering on a tightrope between two diametrically different worlds, is a gripping tale—like a Hollywood story, but it is all true.” —Stephen C. Schlesinger, co-author of Bitter Fruit: The Story of the American Coup in Guatamala (with Stephen Kinzer), Act of Creation: The Found- ing of the United Nations, The Letters of Arthur Schlesinger, Jr.,Edited by Stephen C. and Andrew Schlesinger. The story, while intimately focusing on the struggle of this one Italian-American family at a particular point in history, is a universal one, applicable to many immigrant families and their journeys, and the destructive human consequences of stereotyping and divided loyalties. ABOUT THE AUTHOR: STEVE VILLANO, a native of Brooklyn, New York, is the former head of Governor Mario M. Cuomo’s New York City Press Office, with decades of experience in public service, public education, public health, and as CEO of several national, non-profit organizations. His writing has appeared in mass circulation newspapers and magazines such as The New York Times, Newsday, The Albany Times Union, The Rochester Democrat & Chronicle, the Napa Val- ley (CA) Register Newspaper Group, the North Shore (Long Island) Newspaper Group, Working Mother Magazine, Associations Now Magazine, and Today’s Education. His essays have been published on-line on the WritersDigest.com, www.thenationalmemo.com,, with a subscription circulation of 300,000; on Medium.com., and on his blog, Radical Correspondence, (www.socialvision- productions.com). Villano has authored major pieces on ethnic stereotyping in Ambassador Magazine, (the National Italian American Foundation’s 100,000 circulation magazine) about actors Stanley Tucci, John Turturro, and the HBO series “The Sopranos.” A labor journalist for the National Education Association for a decade, Villano has written about censorship, the rise of the Far Right in America and about sweatshop conditions at cap and gown factories in New York. Villano presently lives in Northern California.